A good time for a good cause is being planned by a kids’ Relay for Life of Fulton County team. The Kids Knocking Out Cancer team will present a Glow Party on Friday from 6-9 p.m. at the Lyons VFW Hall, 122 W. Morenci St.
Brynn Trumbull, 12, had been on a family Relay for Life team since she was three months old. Her friend, Isaac Hansel, joined her in starting their own team in 2016, when they were both nine years old. The Kids Knocking Out Cancer Relay for Life Team is the only Relay team at the Fulton County event comprised of just kids. “We wanted to have a team with just kids, to do fun fundraisers,” said Brynn. They recruited friends and cousins to join the team which now numbers 16 children ranging in age from 6-13. The majority of the team members are from the Evergreen school district, along with a few from Fayette and Madison Township in Michigan. “Since we are a kids’ group, we focus on fundraisers that kids would like,” said Brynn. 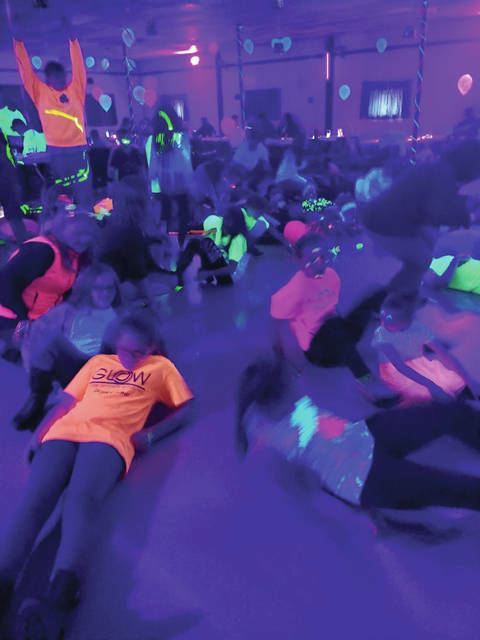 The Glow Party is described as a black light dance party full of neon glowing colors, specifically designed for kids and families. The party will include Coyote Sounds DJing, basket raffles, food, games, and activities. This is the fourth Glow Party they are hosting. The first one was held when they were still on a team with parents. When the kids’ group was formed, they took it over and made the party bigger, with more lights and more neon colors. “I thought it would be a fun way to raise money,” said Isaac on the inspiration for the party. Team members promise a fun night for the whole family. There is a $5 cover charge per person at the door, with a $20 max per family household. All proceeds from this event go to the American Cancer Society, Fulton County Ohio Relay for Life. Members of the team also encouraged others in Fulton County to join the Relay for Life event in the county. Those interested can form a team or just attend the annual Relay for Life. This year, it will be June 8-9 at the Fulton County Fairgrounds. The Kids Knocking Out Cancer will be there and up all night having fun along with raising money. At their team site they will offer face paint, hairspray color, and have an art sale.